1. Short title, extent and commencement .—(1) This Act may be called the Chandigarh Disturbed Areas Act, 1983. (2) It extends to the whole of the Union territory of Chandigarh. Statement of Objects and Reasons.-The activities of the extremists, terrorists and secessionist elements in the State of Punjab and the Union territory of Chandigarh have been a matter of serious concern. These persons have been indulging in violent activities, terrorist methods and encouraging illegal activities. In order to arni the police authorities in Chandigarh with additional powers to deal with the situation which had arisen as a result of these activities and to restore conditions of peace and normalcy in Chandigarh, the President promulgated on the 7th day of October, 1983, the Chandigarh Disturbed Areas Ordinance, 1983 (No. 6 of 1983). 2. The Bill seeks to replace the Ordinance. (b) “disturbed area” means the area which is for the time being declared by notification under section 3 to be a disturbed area. 3. 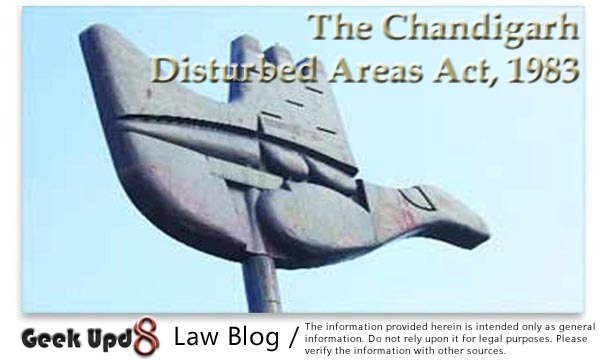 Powers to declare areas to be disturbed areas .—The Administrator may, by notification in the Official Gazette, declare that the whole or any part of the Union terriotory of Chandigarh as may be specified in the notification, is a disturbed area. 4. Power to fire upon persons contravening certain orders .—Any Magistrate or Police Officer not below the rank of Sub-Inspector of Havildar in case of the Armed branch of the Police may, if he is of opinion that it is necessary so to do for the maintenance of public order, after giving such due warning, as he may consider necessary, fire upon, or otherwise use force, even to the causing of death, against any person who is acting in contravention of any law or order for the time being in force in the disturbed area, prohibiting the assembly of five or more persons or the carrying of weapons or of things capable of being used as weapons or of fire-arms, ammunition or explosive substances. 5. Powers to destroy arms dump, fortified positions, etc .—Any Magistrate or Police Officer not below the rank of a Sub-Inspector may, if he is of opinion that it is necessary so to do, destroy any arms dump, prepared or fortified position or shelter from which armed attacks are made or are likely to be made or are attempted to be made or any structure used as training camp for armed volunteers or utilised as a hide-out by armed gangs or absconders wanted for any offence. 6. Protection of persons acting under sections 4 and 5.—No suit, prosecution or other legal proceedings shall be instituted except with the previous sanction of the [Central Government] against any person in respect of anything done or purporting to be done in exercise of the powers conferred by sections 4 and 5. 7. Repeal and saving .—(1) The Chandigarh Disturbed Areas Ordinance, 1983 (6 of 1983), is hereby repealed.